Sécheron XMS and BW high-voltage modular indoor disconnect switches can be used as disconnector or change-over switches on rail vehicles and in other industrial applications. Our XMS indoor disconnect switches can be configured as single-pole pantograph disconnectors for railway Electrical Multiple Units (EMUs) running on 1.5 kVDC and/or 3.0 kVDC networks, as single- or double-pole traction circuit reconfiguration switches for multisystem vehicles, and as 3-pole motor disconnectors. XMS disconnectors can be delivered on a stand-alone basis or integrated into Sécheron’s smart, compact MODBOX® high-voltage enclosure with other high- and low-voltage functions to ensure the electrical safety, measurement, and control of the traction chain. Our BW indoor disconnect switches feature a modular, linear design that can accommodate different numbers of moving contacts and high-voltage terminals, enabling a wide range of configurations and applications. 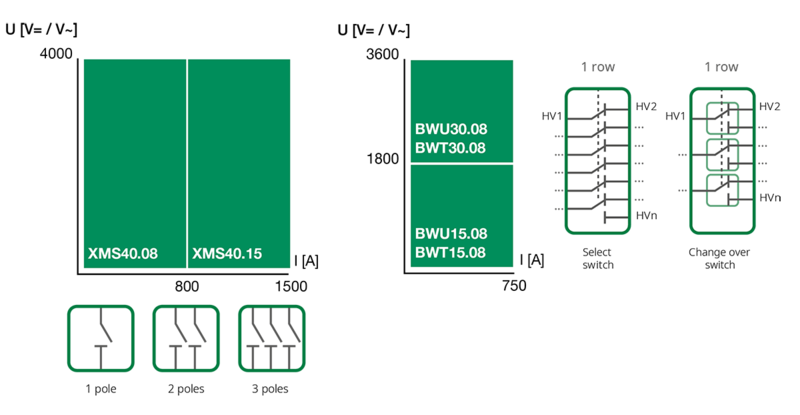 BW switches are mainly used to select or change the configuration of traction or/and auxiliary circuits. Rated insulation voltage 4000 VAC/DC. Current range up to 750A (BW) or 1500 A (XMS). 1, 2 or 3-pole versions (XMS). Up to 24 high voltage terminal (BWT) or 56 (BWU). Rated short-time withstand current 20kA/50kA (BW), 60kA (XMS). No making nor breaking capacity (BW). Reduced making and breaking capacities (XMS). Electric, Electro-pneumatic or manual operation (BW). Mechanical closing and opening time < 100 ms (XMS). Switching time from 1 to 3 sec (BW). Reference standards: IEC 60077-2 (XMS), IEC77 (BW).